Wake up where the clouds are far behind me. And the dreams that you dare to. I'll watch them bloom for me and you. And the brightness of day. Are also on the faces of people passing by. They're really saying, " I...I love you!" They'll learn much more than we'll know. Oh, somewhere, over the rainbow, way up high. This version has been used in several commercials, films and television programs including Finding Forrester, Meet Joe Black, 50 First Dates, Snakes on a Plane, Charmed, South Pacific, Cold Case, ER, Life on Mars, Horizon, and Scrubs. The Kamakawiwoʻole version of the song was covered by the cast of Glee on the season one finale "Journey", and included on the extended play Glee: The Music, Journey to Regionals, charting at number 30 in the UK, 31 in Canada and Ireland, 42 in Australia, and 43 in the US. Cliff Richard recorded his own version of the medley, released as a single from the album Wanted, which charted in the UK. 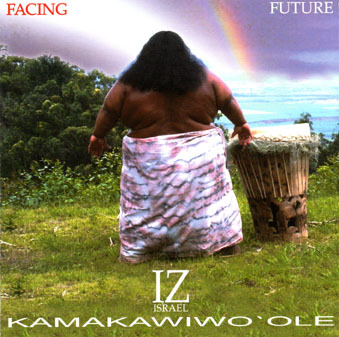 Facing Future is an album by Hawaiian singer Israel Kamakawiwo'ole, released in 1993. Israel "IZ" Kaʻanoʻi Kamakawiwoʻole (Hawaiian pronunciation: [kaˌmaka,vivo,olay]) translation: "The Fearless Eyed"; May 20, 1959 – June 26, 1997), also called Bruddah Iz ("Brother Iz"), was a Hawaiian musician. His voice became famous outside Hawaii when his album Facing Future was released in 1993. His medley of "Over the Rainbow" and "What a Wonderful World" was subsequently featured in several films, television programs, and television advertisement commercials. Through his skillful ukulele playing and incorporation of other genres (such as jazz and reggae), Kamakawiwoʻole's music remains a very strong influence in Hawaiian music.